I'm so excited! After a few months of rest, one of my favorite things is coming out of hibernation. I'll give you two hints- it has to do with dressing + dining. Obviously, you'll never be able to figure it out. Obviously. So I'll give you one more hint: these bite-sized empanadas. And a chimichurri sauce that is everything. Seriously, you'll be wondering where this sauce has been all your life and you'll want to start putting it on everything licking it straight off your fingers/drinking it right from the container. But try to control yourself, because a little thing called Cinco de Mayo is just a week away and that's when the real empanada and chimichurri party starts. 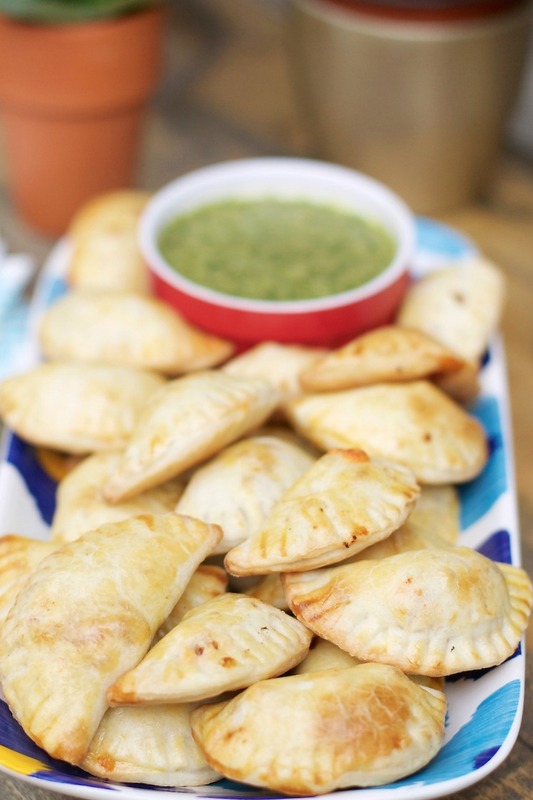 FYI, besides chimichurri sauce, these empanadas are the next best thing ever. They're super easy to make and super delicious (because obviously I wouldn't be posting the recipe if they weren't). And also, bite-sized. Bite-sized things are my jam, because isn't it the greatest thing ever when you can have seconds (and thirds....and fourths....and tenths) and not feel the least bit guilty because, duh, they aren't full size?! And just in case you're wondering, yes, I did go back for tenths, but before you judge me, remember, bite-sized! One last great thing about these empanadas is the ability to make them your own through the endless variety of fillings- kale & sweet potato, sweet potato & chorizo, chorizo & scrambled eggs, salsa & chicken, avocado & corn. Obviously, when I said "greatest thing ever", I wasn't lying! In a food processor, combine the flour, sugar and salt. Pulse for a few seconds. Add the butter and pulse 6-10 times, or until the mixture resembles coarse crumbs. With the food processor running, slowly start adding the water a 1/4 cup at a time. Continue adding water until the dough sticks together and forms a ball (FYI, you may need more or less water). Turn the dough onto a floured surface and knead just a few times. Divide the dough in half. Shape each half into a disk and then wrap in plastic wrap. Refrigerate for at least an hour, or up to 2 days. In a large skillet set over medium heat, add the olive oil. Heat for a few minutes, then add the onion and cook for 5-10 minutes, or until translucent. Add the garlic and pepper and continue sautéing for about 2 minutes. Next, add in the spices, tomato paste, sugar and salt, and pepper. Stir a few times then add the meat. Brown the meat for about 5 minutes, then add in the water. Continue cooking and stirring until the meat has cooked through and he liquid as been reduced to a thick sauce. Give a quick taste test and, if need be, add in more salt and pepper. On a lightly floured surface, roll out one disk of dough at a time until it's about 1/8 inch thick. Use a 2-inch biscuit cutter to cut rounds of dough. In the center of each round place about 1 teaspoon of the meat mixture and top with a little cheese. Dip your finger into a small bowl of water and moisten the edges of the dough. Fold the dough over the filling to create a half-moon shape, making sure that the edges meet. Press the edges together then seal by pressing all along the edge with a fork. Continue until you've used all the dough and filling. Transfer the empanadas to the baking sheet, then use a pastry brush to give them an egg wash.
Store leftovers in an airtight container in the fridge for up to 2 days. Leftovers can be reheated for a few minutes in the oven or they can be eaten cold. The pepper for the filling does not have to be roasted, but it does taste better (in my opinion). The quickest way to roast a pepper is to turn on a gas burner and putting the pepper directly onto the flame (yes, right on there). Use tongs to turn it every few minutes. It will crackle and pop a little bit, which is totally normal. After a few minutes, the pepper should be blackened and roasted. Remove from the flame and allow to cool. You can then remove the skin, if you choose, by place the pepper in a water bath and gently rubbing the skin off, or you can use the pepper as is.